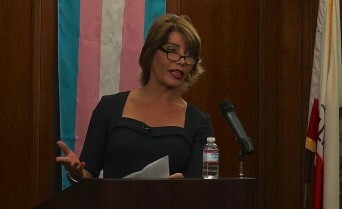 Michaela Mendelsohn gives the keynote speech during the first annual Transgender Day of Remembrance held in Ventura Friday evening. LGBT Activist Michaela Mendelsohn recently became the first transgender member of The Trevor Project board. If Mendelsohn’s name looks familiar, it’s probably because she has been working for equality for awhile now. 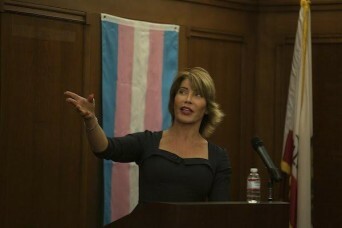 A popular public speaker- Mendelsohn also works with the California Trans Workplace project and has worked as a consultant for Laverne Cox’s character on ‘Orange is the New Black,’ Mendelsohn has been busy working both to get truthful trans stories told as well as aggressively working to promote transgender employment opportunities. Get to know her better by reading our one-on-one interview below, where we discuss the Trevor Project, Orange is the New Black, transphobia in the LGB community and her advice for trans people struggling with employment. to sit on the Board? It’s both an honor and a huge responsibility. I have tremendous respect for the work they are doing. Saving lives and improving conditions for LGBT youth from 13 to 24 years old. I feel it is my job to offer perspective on the needs of the trans community and to assist in the most effective ways to communicate their messages. As a public speaker I can also ingrate their messaging into my engagements. The number of calls Trevor receives from trans youth are increasing in proportion to those they receive from gay youth. Why do you think it has taken this long for a trans-woman to join the board? It is not like they were not paying attention to the needs of the Trans Community before but with the huge rise in awareness the past two years, the need may have become more evident. What was it like working with Genji Kohan on the set of Orange is the New Black? I never did get to work on their New York set though I did spend several hours with Genji and her writers at their Universal studios offices and later by phone with the writer assigned to the character played by Laverne Cox. They were looking for help in understanding the trans experience especially how it might have related to the back story of this character. My goal was to help them get it right and urged them to hire a trans actress to play the role. They did both of which I am very proud!! How did you get involved with that project? I received an email from my friend Gary Lennon who was on their writing staff. I was invited to come down and meet with them at Universal. What was your favorite “Orange is the New Black” moment? pink underwear under his work clothes. They also did a great job in the relationship scenes with the wife. Fun fact- Mendelsohn was the first transgender contestant in the Ms. Senior California Pageant! Your life story, “Making Michaela” is being produced by Celebration Theater and will enter into full production in 2016. Is it weird to have your life out there for everyone to see? people. I do hope to put some energy into the play later in the year. Most likely I will look for a writer and a director to work with to move the project forward. Having my life on stage is not an issue for me. I have told my story about 200 times in my speaking engagements. After a lifetime of keeping secrets it is cathartic to not have any. Recently, a petition was being circulated online that argued for removing the “T” from “LGBT.” It was roundly dismissed as a hatefully, divisive idea. However, there there is a transphobia in the cis-gender queer community. Have you ever experienced this first hand? Yes, a number of times. It became clear during my transition that heterosexual women were more supportive and less judgmental than queer women. It was surprising and confusing to me, as I expected it to be the opposite. It was hurtful at times but I came to realize that the gay community doesn’t really understand the trans experience and everyone is supporting their own political and social agendas. There is not much they have in common other than both being marginalized and stigmatized segments of society. I am beginning to realize, however, there are many intersections between gender identity and sexual orientation. What steps should cisgender queer allies take to support the trans community? I think it starts with conversations they have with other people whether friends or co-workers. Being respectful in our choice of language. Using proper pronouns and helping spread an attitude of not only tolerance but “celebration” for each person’s uniqueness. I know its corny but the “golden rule” applies here. We all have experienced prejudice in our lives. We can allow these experiences to deepen our empathy for others. We can also support legislation which is supportive of each letter in LGBTQ. Trans people have a ton of hurdles to overcome when it comes to building a career. You’re a successful CEO of Pollo West. What advice would you give to your peers who are struggling with advancing in the work place? Thanks for pointing this out. It is a huge struggle for most transpeople who are either trying to get work or are wishing to transition in the workplace. This is especially true for trans women of color. I realize I was fortunate in that I became successful before my transition. As the boss I didn’t worry about losing my job though I did experience transphobia from other franchisees, by my franchisor and my lender. But, that’s for another story. I started CTWP after hiring a few trans employees and listening to some of the terrible experiences they had in their previous jobs. We have now hired 10 trans employees. Three have made it into management with a fourth on her way. We get more compliments on our trans employees than their 200 co-workers. I should mention that 3 out of 5 transpersons work in states that still have no protection in the workplace for gender identity. And transgender people are more than twice as likely to live in poverty. Posted January 7th, 2016 & filed under Activism, Entertainment, Interviews. Will State of the Union address ENDA?